Deep in south-west Ukraine, not far from the Carpathians, is a city with the strange-sounding name of Ivano-Frankivsk. This capital city of the region with the same name has a good 200,000 inhabitants. It has a university, a substantial old town with buildings dating back to the old Habsburg era and a huge monument to the Ukrainian author Ivan Franko. The soviets named the town after him in 1962. At first glance it looks like any other provincial town, it has long been overshadowed by its more important neighbours like Lviv and Chernivtsi, and has little to keep young people from leaving or to attract Western tourists. Little, that is, apart from its lively artistic and literary scene, which has flourished since the 1990s. The representatives of this phenomenon can be met in person: on the city's boulevards, in the cafés, at public readings or on the marketplace – sometimes also as barkeepers, translators and dishwashers. Astonishingly, the name for this scene in Ivano-Frankivsk dates back to the old Austrian-Galician name for the city, which was still in use less than a hundred years ago: Stanislau. In finding out what the Stanislau Phenomenon is all about, the first person to meet is the literary phenomenon Yuri Andrukhovych. Born in 1960, the author (poems) and translator who became known in the West with his essays and the novel "Perverzion", is the alpha wolf of the "Stanislauers". Together with artists and authors like Yurko Izdryk, Taras Prochasko, Halyna Petrosanyak and others, he has succeeded in making the artistic life of this Eastern European provincial town into a trademark of its own. The historical Galician name Stanislau provides the young authors and artists with a banner untarnished by the Soviet legacy, while at the same time offering strong ties to the city where they live and work. Like many others, Yuri Andrukhovych first set himself up in the more intellectual Lviv. He was successful, but that didn't stop him from coming back to the town that had brought him his initial fame. His growing reputation has meanwhile made him the busiest traveller among the Stanislauers. When he doesn't happen to be shooting with a German television crew, researching in the Carpathians or working on his newest novel in Berlin, Andrukhovych still lives in his native city, which in his novel "Zwölf Ringe" (Twelve Rings, more here) he calls half ironically and half conciliatingly Stanislavo-Frankivsk. 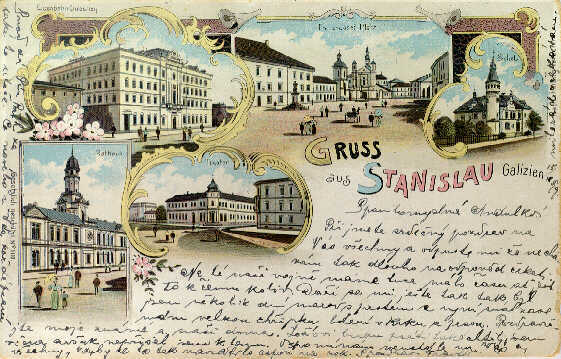 Andrukhovych himself started the circulation of a sort of pseudo-legend about the origin of the Stanislau Phenomenon: two west-Ukrainian hippies recognised the legendary Macondo, the mythical-magical location Gabriel Garcia Marquez thought up to evoke his home town in his novels, on a postcard of the ugly Ivano-Frankivsk. According to Andrukhovych, this moment of sudden recognition marked the actual birth of the Stanislau Phenomenon. What he really means by this he doesn't say. Perhaps he simply wants to send a wink and a nod to his readers that the birth of the phenomenon needs no historical justification. For Wolodymyr Jeschkilew, a cultural critic located in Lviv, the matter is even simpler: the term "Stanislau Phenomenon" simply invented itself at one of the typical happenings. Jeschkilew uses the term to denote the artists and writers living in Ivano-Frankivsk who quickly became affiliated with Western postmodernism after the collapse of the Soviet Union. The poet Halyna Petrosanyak, born in 1969, belongs to the very historical core of the Stanislau Phenomenon. She has long made a name for herself with her lively poems and translations, and talks about her fellow artists with friendly admiration. For her the Stanislau Phenomenon is less a category of literary studies than part and parcel of her life in this city with its open, stimulating cultural scene. Petrosanyak herself does not come from Ivano-Frankivsk, but she studied here and stayed on like many other artists, regarding the city as a multicultural frontier between East and West. In fact, Halyna Petrosanyak seems to live in two places at one time. For her Ivano-Frankivsk is the city where she earns her living teaching German to Ukrainian militiamen. A Ukranian provincial town like many others, marred by the construction sins of the Soviet era which, like today's garish world of advertising, she discreetly ignores. And then there is the legendary Stanislau with its historical buildings from the Austro-Hungarian Empire, part of a common historical and cultural space that is not defined by exclusion. The large monument to Galician poet Ivan Franko invites one to reflect on the city's changing names. When it attained its Magdeburg rights on March 7, 1662, the city was originally called Stanislaviv. By giving it this name, the Polish magnate Andrzej Potocki was attempting to immortalise his son. But he was only partially successful. As part of the Habsburg monarchy between 1772 and 1918, the Polish Stanyslaviv became the German-Jewish Stanislau. For most of the artists, the renaming of the city in 1962 is nothing but a colonial farce from the Soviet era (making the poet Ivan Franko, who died in 1916, the victim of an involuntary distinction). Against this background, the Stanislau Phenomenon is also a call-to-arms against a history set in concrete. "Young, well-educated authors and artists," says Halyna Petrosanyak, "have been given an opportunity to write and paint as they wish. And they're taking advantage of it!" The fact that "charismatic personalities have had a strong presence in the town", people like the globe trotter Yuri Andrukhovych, the one-man publisher Yurko Izdryk and the lebenskünstler Taras Prochasko, she thinks is a blessing for local history. Halyna Petrosanyak is a woman of refreshing understatement. Apparently the things that Yuri Andrukhovych told the Austrian magazine Literatur und Kritik in June 1997 were not entirely true. He reported that the "unusual and beautiful poet" Petrosanyak earned the three hundred dollars that she needed to publish her poetry collection "Park am Abhang" (park on the slope), by working as a cook in the Czech Republic. But she can't cook for her life, says Halyna, in fact she washed dishes. And it's only in passing that she mentions she also learnt Czech during this time, to explore the literary worlds of Hrabal, Kundera and Capek. In her sometimes wistfully melancholic poems, the remoteness of her home village and the timeless world of the Carpathians play a central role. Petrosanyak also writes about the city as a space of personal fulfilment. Part of the joy of living in the city, she writes in one of her poems, is having a "wandering philosopher" who regularly drinks his morning coffee beneath her balcony. This wandering philosopher could very well be her monosyllabic colleague, Taras Prochasko, who frequently roams across the Carpathians and enjoys ample esteem in the literary world. Prochasko, who is just as at home in the mountains as in the city, completed his degree in biology in Lviv. He has worked in a kindergarten, as a schoolteacher and behind the bar. He made his literary debut in the underground paper Chetver (Thursday), which has played a legendary role in the Stanislau Phenomenon. Prochasko has also worked for newspapers and the local radio station. Here, every day for four months, he produced three-minute mini-pieces somewhere between a diary and short prose. The pithy radio novellas take a philosophical look at life in the city, the region and Ukraine. One of the most haunting pieces deals with the relationship between city and mountains. The essence of a city, writes Prochasko laconically, is manifested in the presence of a wall and a tower. The mountains by contrast are a haven for the artist, who has a knack for moving between urban restriction and the liberation of nature, and for transforming this into art. That the Stanislau Phenomenon also has international appeal was first demonstrated by Ljubko Deresch, the new "wunderkind of Ukrainian literature". At the tender age of 17 he wrote an unusual novel with the evocative titled "Kult", which has now appeared in German. This novel oozes the spirit of the Stanislau school, and so it comes as no surprise that there was much speculation about it really being a product of his Stanislau sponsors, Andrukhovych and Izdryk. A glimpse at the theatre programme of the Dusseldorf Schauspielhaus shows just how far the Stanislau Phenomena has now spread. Yuri Andrukhovych's first play, "Orpheus, Illegal", was written for this theatre. The play deals with an Orpheus-type figure from Lviv, whose first name rings a clear bell because it reveals his real origin: Stanislav Perfetsky. See our feature "The carnival continues", an interview with Yuri Andrukhovych. The article originally appeared in German in the Frankfurter Allgemeine Zeitung on January 19, 2006. Holger Gemba teaches Slavic languages and literature at the Ruhr-Universität Buchum.